Senior citizens tours in Kenya has been a big part of Ontdek with 70% of our clients falling in the 50 plus category. At our foundation in 1996, we made a deliberate decision to offer our wildlife safaris in the nature–themed format of guided game viewing walks, bird watching holidays and responsible wildlife viewing away from mass tourism. - If ever there is an area of travel where trust is crucial it is with seniors. Do a due diligence on your outfitter for your senior’s safaris. Go on and check the independent reviews of the company, better still if you can get a one-on-one feedback from people who have traveled with them. - A travel tip on price – while you of course have a budget you want to stick to, let price not be your main yardstick in choosing an operator. Better to pay slightly more and you are sure of quality & provider’s reliability. 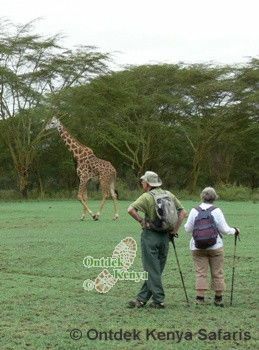 - You expect your provider for your senior citizen tour to offer inside info about Kenya + what is safely doable etc. But be on the look out that the provider will not push you to a safari that he thinks suits a 50plus traveler and not one that suit your interests. You don’t have to take an off-the-shelf safari package where you are cooped up in a safari bus all day. - If taking a group tour – find out the likely composition of the group. Though many senior citizens are young at heart, they still prefer a group with like-minded elder travelers. It might stretch your patience if for 2 weeks you are in a group of 22 year olds. Review our travel programs for senior citizens and we look forward to consulting with you for your Kenya safaris. Kindly contact Ontdek Kenya Safaris.